Maurizio Sarri has backed Eden Hazard to win the Golden Boot, and says he has told the attacking midfielder he can score 40 goals this season. Hazard scored a hat-trick in Chelsea's 4-1 win over Cardiff City on Saturday to take his tally to five goals in five matches this season. Last season's Golden Boot was won by Liverpool's Mohamed Salah, who scored 32 Premier League goals, with Tottenham's Harry Kane second on 30. Hazard's record total in a league season is the 20 goals he scored for Lille in Ligue 1 in 2011/12, but Sarri has faith that the 27-year-old can double that haul this campaign. Asked if Hazard can win the Golden Boot, Sarri said: "I think so. We have spoken and I told him he can score 40 goals. He has to improve some things, but he can do it." When pressed on whether Hazard agreed with him, Sarri said: "If you have seen Saturday's match, then I think so." 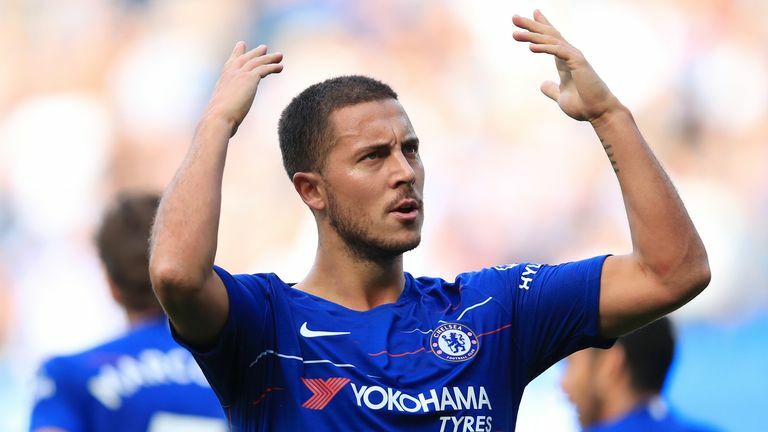 While Hazard inspired Chelsea to a comfortable win over Cardiff at Stamford Bridge, it was not all plain-sailing for the Blues as Sol Bamba put the Welsh side ahead in the first half. Cardiff boss Neil Warnock said after the match that he felt Chelsea may struggle defensively against the top sides in the league, and Sarri agreed with his counterpart. "I think he is right, because we are very dangerous in the defensive phase, we need to improve there," he said. "But I think we can do it. I think it's normal that in this period we have some defensive problems. We can cope with the problems with the quality in the offensive phase, but not in the defensive phase. "I have to organise better the defensive phase and the players have to understand that. "I think my opinion in this moment, two teams, Liverpool and Manchester City are better than us. We have to improve step by step. "My target is to become the best team in England in one year, 18 months. That's the target."